This page is dedicated to the most talented artist, Lawrence Gowan. I have adored his music for the last 12 years. 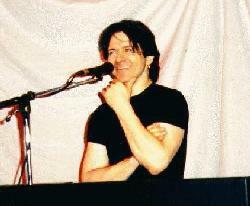 Gowan is a Canadian rock singer and has gone gold with many of his albums. My all time favorite song of his is "Dedication". This song has a lot of personal meaning to me. Whenever I hear it, I get shivers The words mean so much to me. You can read the words to this song on a seperate page listed below. The song you are listening to is called These Eyes. Lawrence re-did this song (originally done by the Guess Who) and it was added to his greatest hits album. On December 4, 1998, my dream came true and I got to go and see him in concert. I had front row and center tickets. I was so excited about it. I had tried to see him a few times in the last few years but something always came up and I couldn't go. I got to meet him personally after the show and he even gave me a hug. I had earlier on in the show screamed out for him to play Dedication but he was unable to at the time. That is why..on the autographed photo above, he signed that. I told him that Dedication meant a lot to me. I was so happy to have seen him. I literally...the next day thought I had dreamnt the whole thing! It was just too good to be true. Below is a few more pages that I have made that has to do with Lawrence Gowan. Just click on the links to view the ones you would like to see. HEAR L.GOWAN'S MUSIC IN .WAV!! LOTS TO CHOOSE FROM! SEE HIM IN CONCERT! WHERE?! FANS! TELL US YOUR THOUGHTS AND MEMORIES OF L.GOWAN! SIGN THE FAN BOOK! VIEW WHAT OTHER L.GOWAN FANS HAVE SAID ABOUT HIM! GET YOUR OWN LAWRENCE GOWAN EMAIL ADRESS! THE FIRST ON THE NET!! Just click on the button below to get your very own! A SPECIAL thank you to my friends and fellow Lawrence Gowan fans Chantele and Edith for their pictures that you can see throughout these pages. Also a Thank you to Bob Roper for his help with some of the information and allowing me to add some of Lawrence's music to my page. NOTE! NONE of the information on these pages are taken from the official website. Click to subscribe to Lawrence Gowan. This mail list discusses Gowan and his concerts. If you would like to view any of the other webpages I have made...look below.